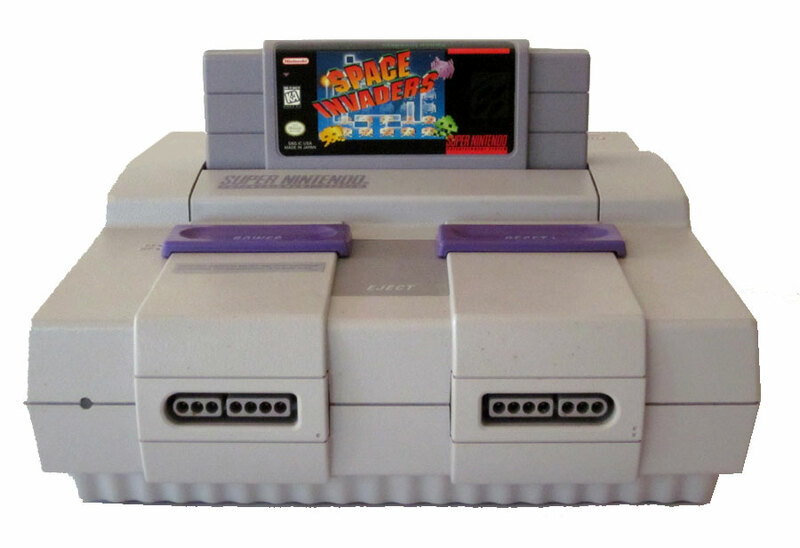 The images of the Nintendo SNES are categorized and show the console, joystick controllers and 3rd party accessories. 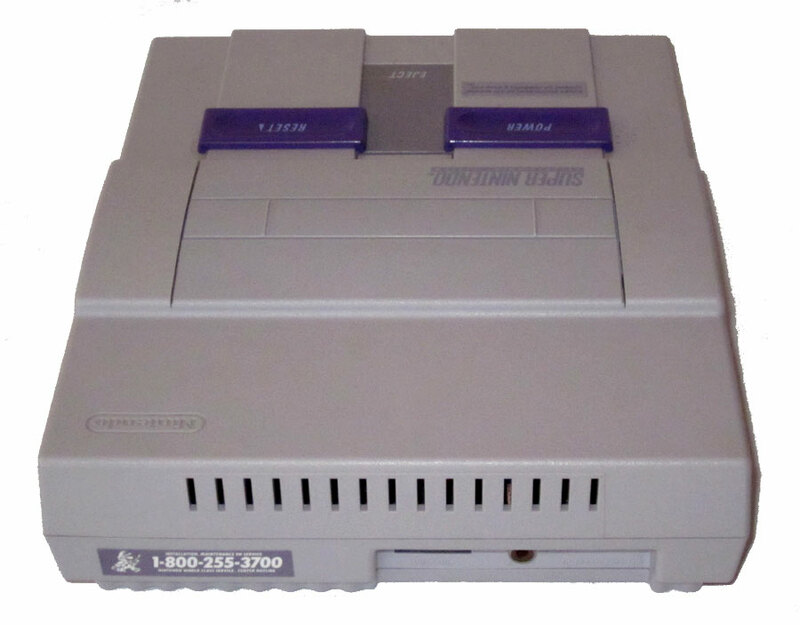 You will also find detailed close-ups of the ports and connections available on the SNES. 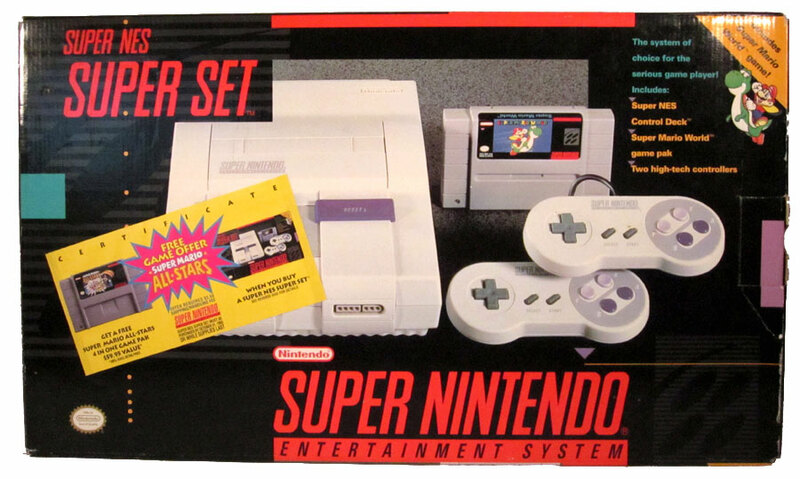 The Nintendo SNES box.The 90s got off to a great start with the follow-up to the NES - Nintendo's Super NES (or SNES) which is a 16-bit video game console released by Nintendo in North America in August of 1991. Front of the Nintendo SNES box with a Mario Allstars offer. 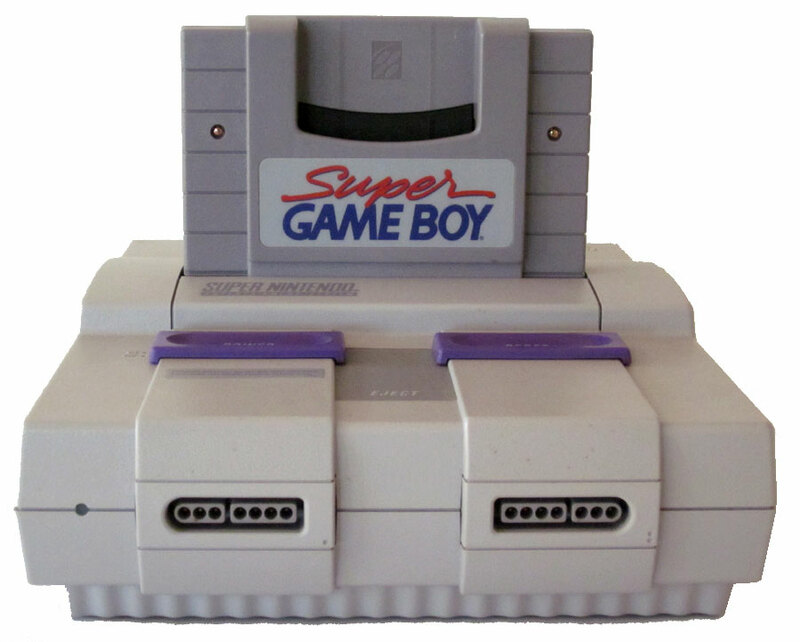 The SNES was known as the Super Famicom in Asia and Japan. 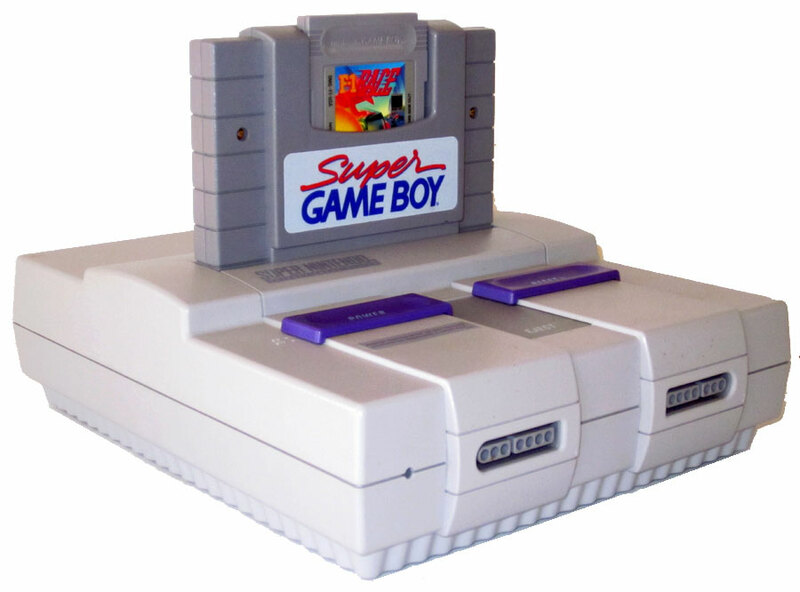 A Korean release was named the Super Comboy and was distributed by Hyundai Electronics. 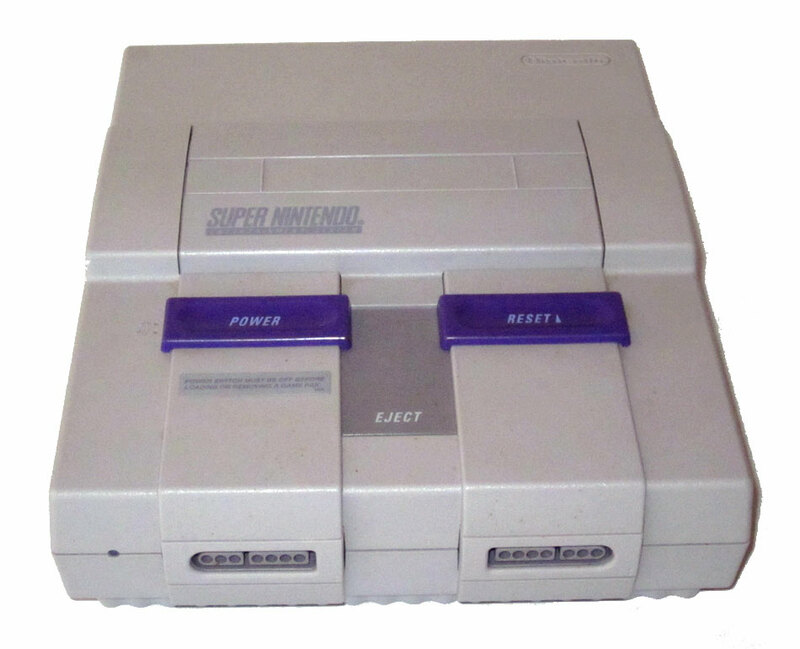 As with most game consoles today, the SNES had Region Coding that created separate (non-compatible games) markets for the SNES. The hardware was much the same, but the games were not playable outside their "region". 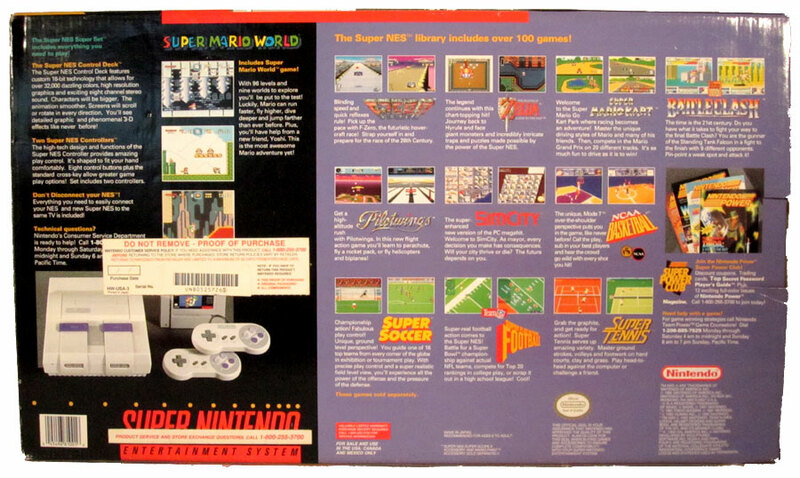 Rear of the Nintendo SNES box showing screen shots from some of the games available at launch. Inside the Nintendo SNES box showing the internal packaging. 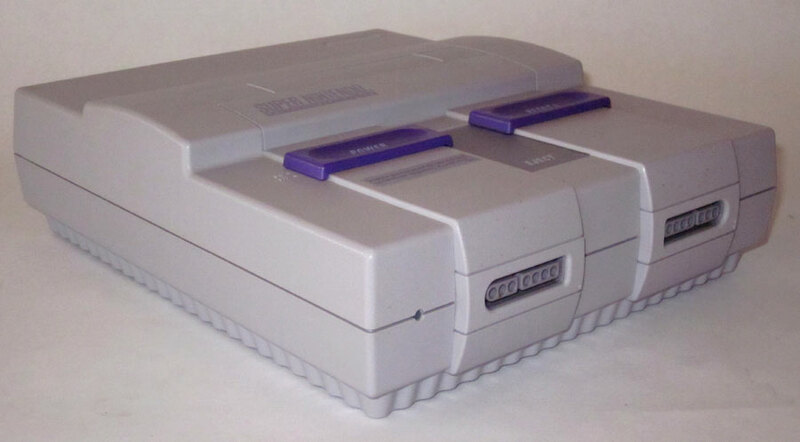 The Nintendo SNES console showing the 2 controller ports. With the release of the Turbo GrafX and Genesis, the NES was still able to hold it's ground against these 16-bit competitors. Nintendo wanted the NES lifecycle to roll on, but they finally had to enter the 16-bit market and did so with the Super NES. Left side of the Nintendo SNES console. The popularity of the Super Famicom's release in Japan was put in perspective as shipments of the console to stores occurred at night to guard against hijackings by the Japanese mob. Right side of the Nintendo SNES console. Rivalry with the Sega Genesis grew as the Genesis was marketed as a system for older gamers which sounds similar to the initial release issues with the Wii being viewed (and advertised) as a console for young children. Nintendo maintained good relations with many of the 3rd party developers for the NES and it's coup on the SNES was being the first console to offer Street Fighter II which gained many fans in arcades. 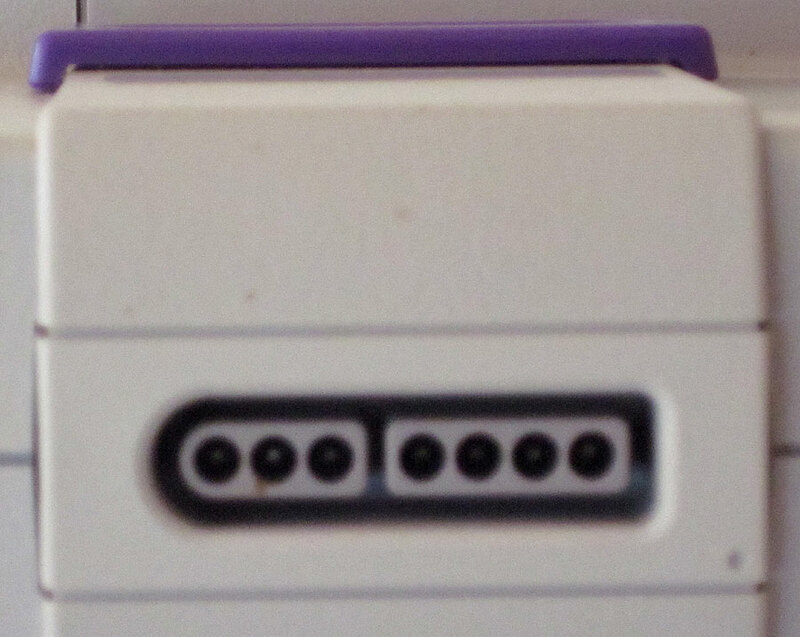 A better view of the ports on the back of the Nintendo SNES console. As 32-bit systems tried to muscle into Nintendo's territory, they released Donkey Kong Country which became the fastest selling game in it's era. 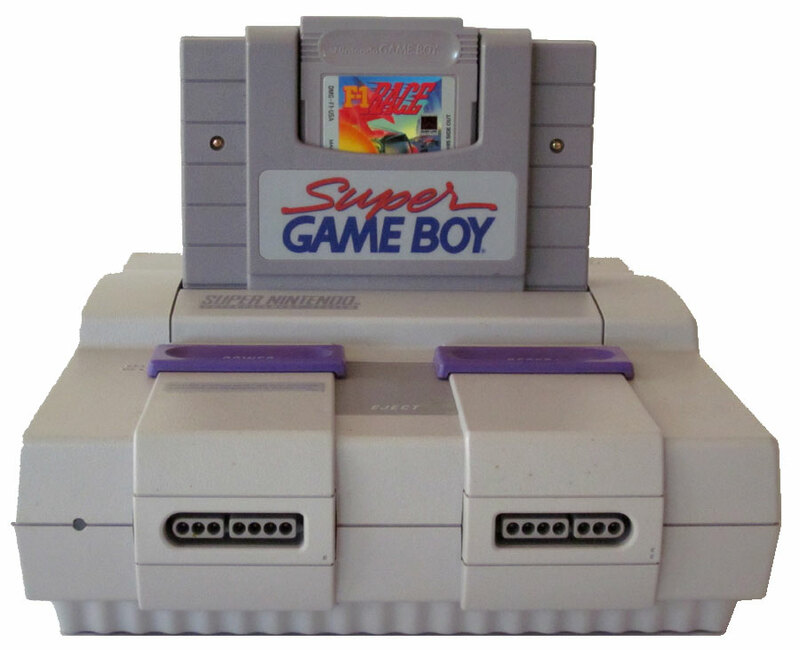 The power of the 16-bit SNES proved it was an able competitor to the 32-bit systems. 32-bit consoles never grew too popular and the gateway to 64-bit was quickly becoming necessary to leap-frog to the next level. 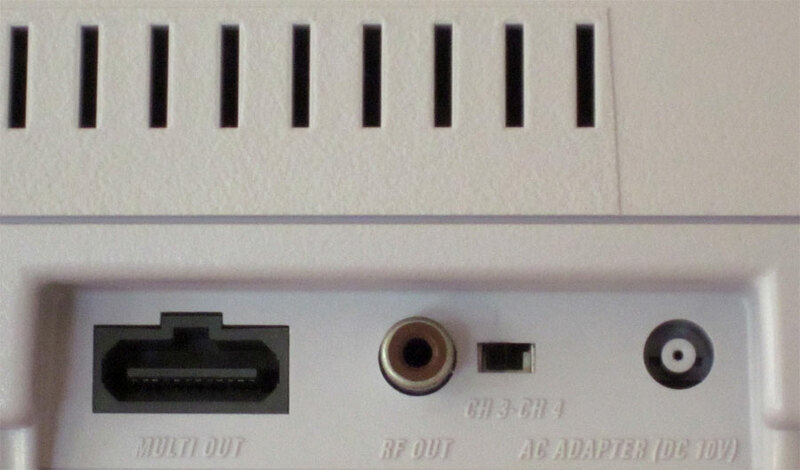 Bottom of the Nintendo SNES console showing the covered external port. In Oct. 1997, Nintendo released a redesigned slimmer model of the SNES in North America for $99, however it lacked both S-Video and RGB outputs. 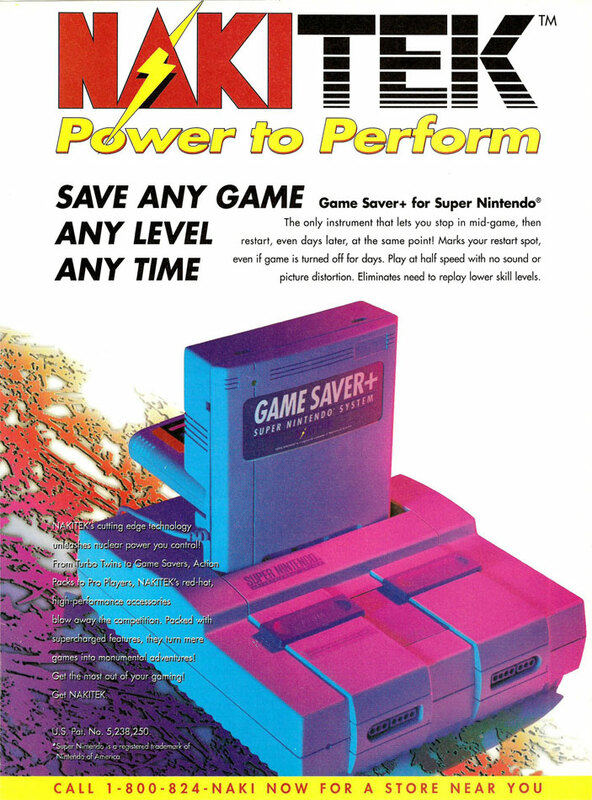 The Nintendo SNES console with Space Invaders cartridge in the top-loading game-slot. Many popular SNES games were ported to the Game Boy Advance, which has similar video capabilities. 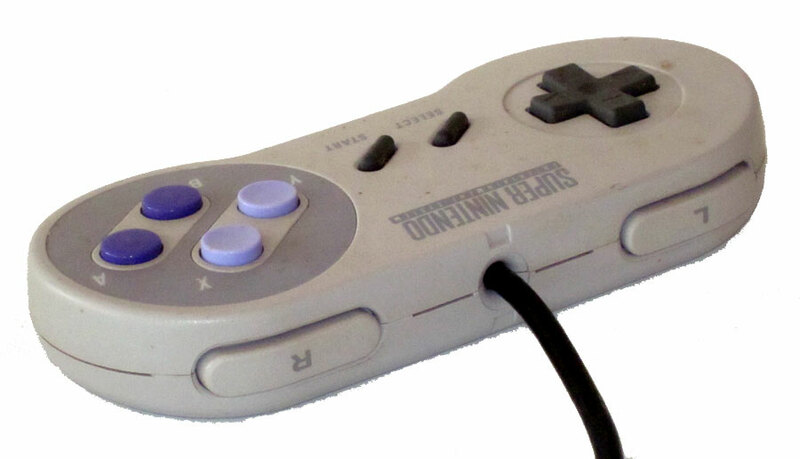 The Nintendo SNES controller that shipped with the console. Mode 7 is a graphics mode forn the SNES that allowed a background layer to be rotated and scaled for many different effects. Most prominent was simulating 3D by transforming the background layer into a 2-dimensional texture-mapped plane that trades height for depth creating a 3-dimensional effect. The Nintendo SNES controller showing the index finger buttons. Third-party controller, made by InterAct, for the Nintendo SNES. This is a direct replacement for the Nintendo controller that shipped with the SNES. InterAct controller for the Nintendo SNES showing the "right" and "left" index-finger buttons. 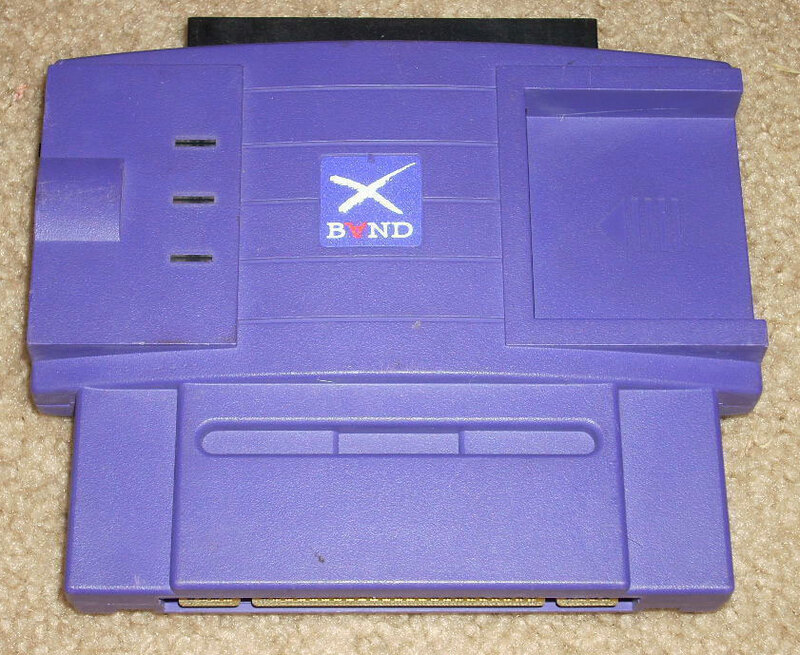 Catapult Entertainment's XBand modem let members connect to a central server, via their home phone line, and play select games against other members. 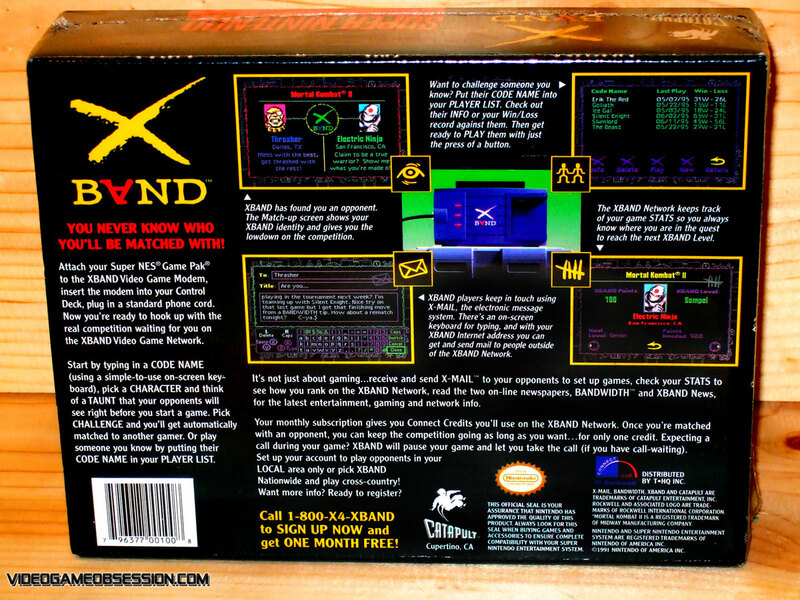 Communicating at 2400 baud didn't deliver a speedy solution, but the modem only transfered controller commands that were integrated with Catapult's software to enable multi-player gaming. 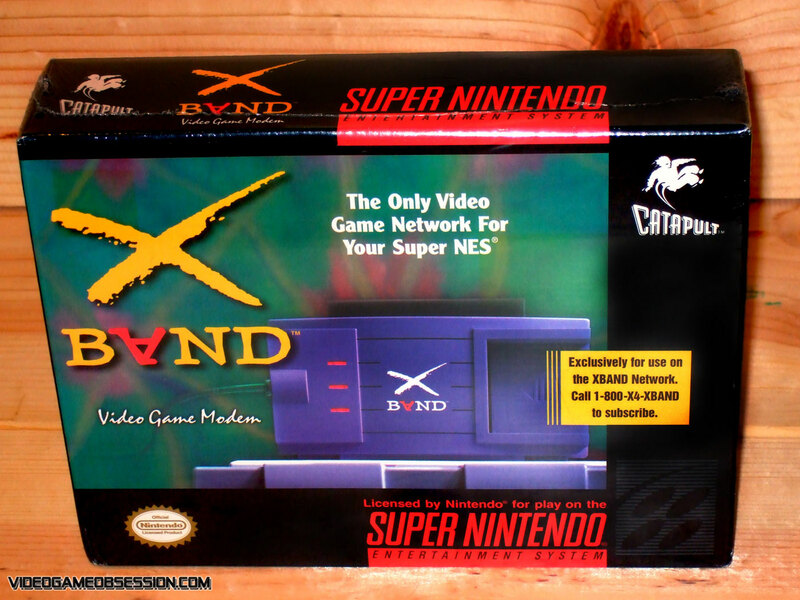 The XBand modem was a licensed product by Nintendo and sold for $19.99. There was also a $30 keyboard that connected to the second controller port. 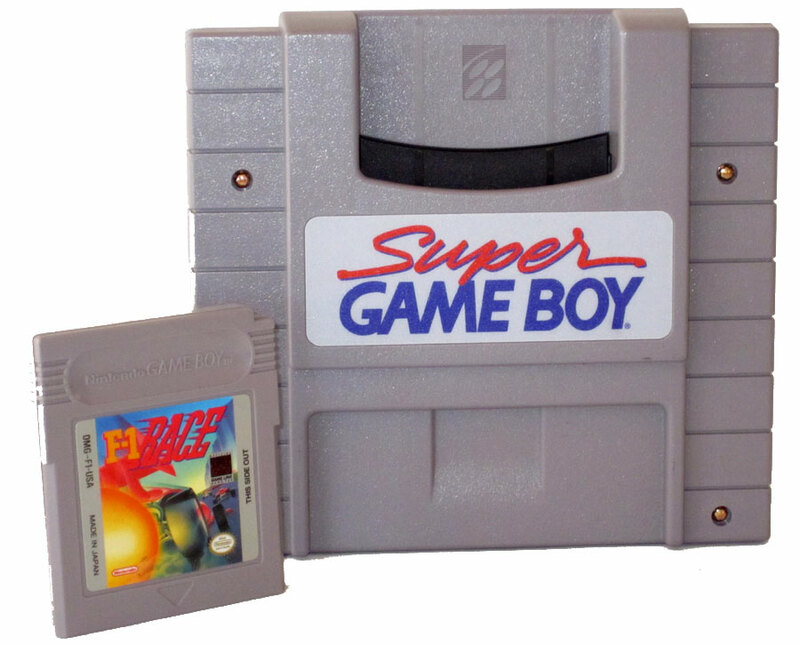 The Super Game Boy adapter fit into the cartridge slot on the SNES providing a cartridge slot for Game Boy games. Playing them on the Super Game Boy enabled play on a big screen and COLOR! I was shocked to see my favorite monochrome games appear in color. 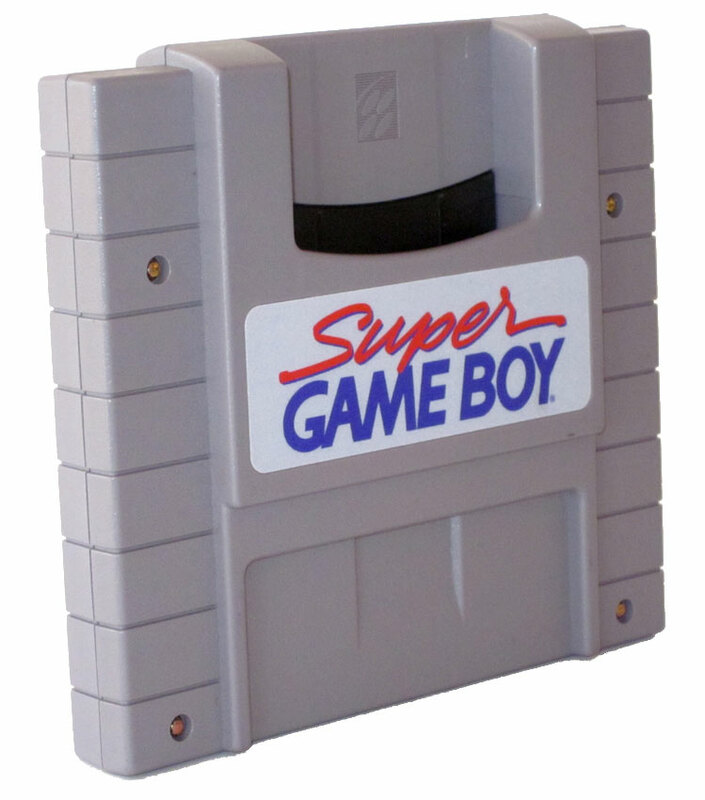 The Super Game Boy adapter was about the same size as an SNES game cartridge, but was a few inches taller. Back side of the Super Game Boy adapter. Super Game Boy adapter laying flat exposing the connection it makes inside the SNES console. Super Game Boy adapter with a Game Boy cart as a size reference. Super Game Boy adapter inserted in the Nintendo SNES game cartridge slot. 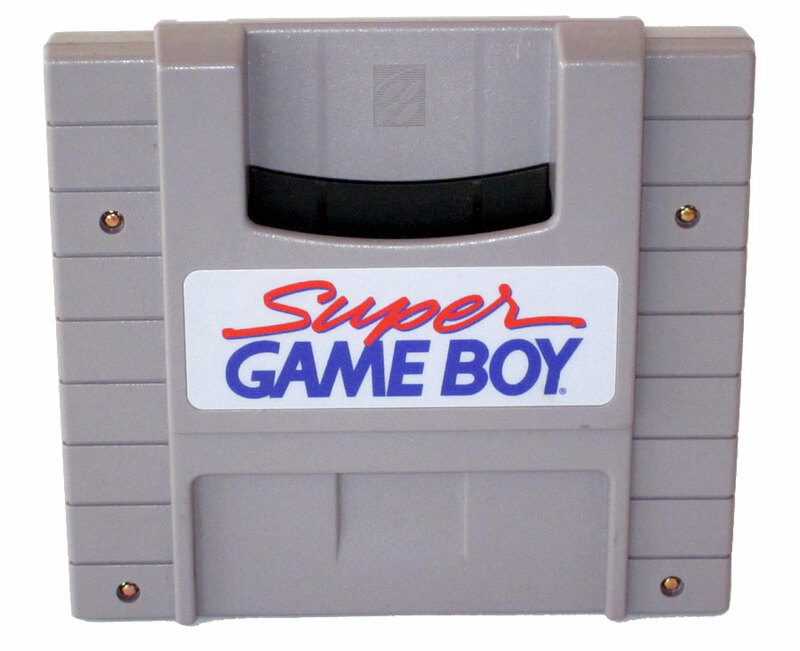 Super Game Boy adapter, with a Game Boy cartridge loaded, inserted in the Nintendo SNES game cartridge slot. 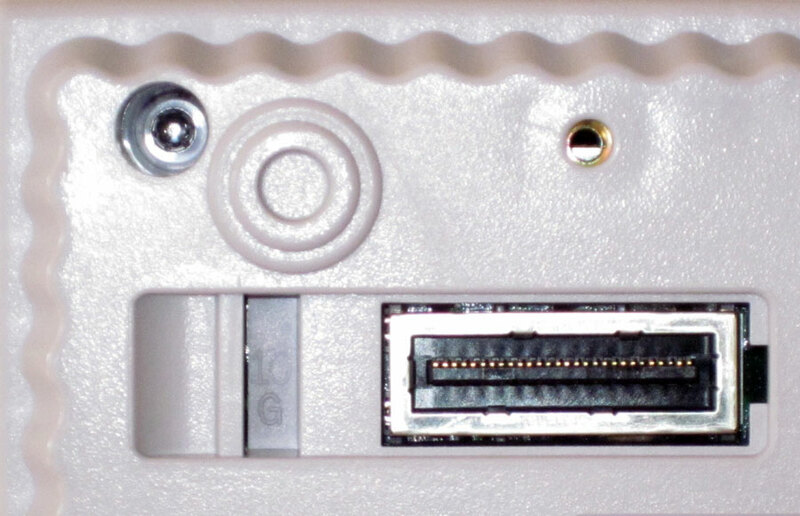 Another view of the Super Game Boy adapter inserted in the Nintendo SNES game cartridge slot. Controller ports on the Front of the Nintendo SNES. The largest games released (Tales of Phantasia and Star Ocean) contain 48 Mbit of ROM data. The smallest games contain only 2 Mbit. 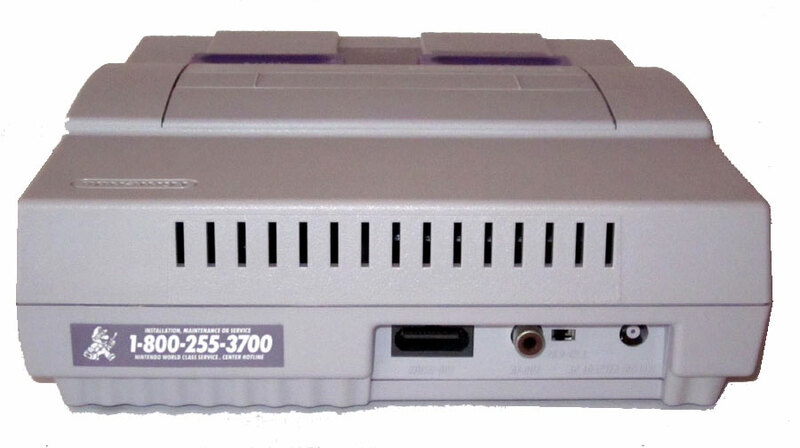 Front of the Nintendo SNES showing a controller port. 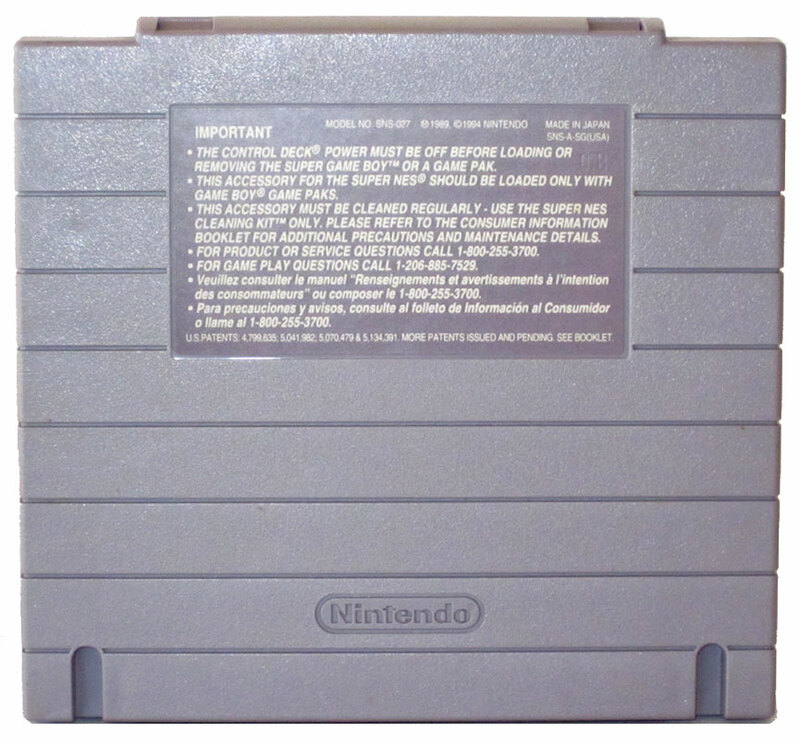 Game cartridge slot on the top side of the Nintendo SNES shown with the door/cover open revealing the inner connection. 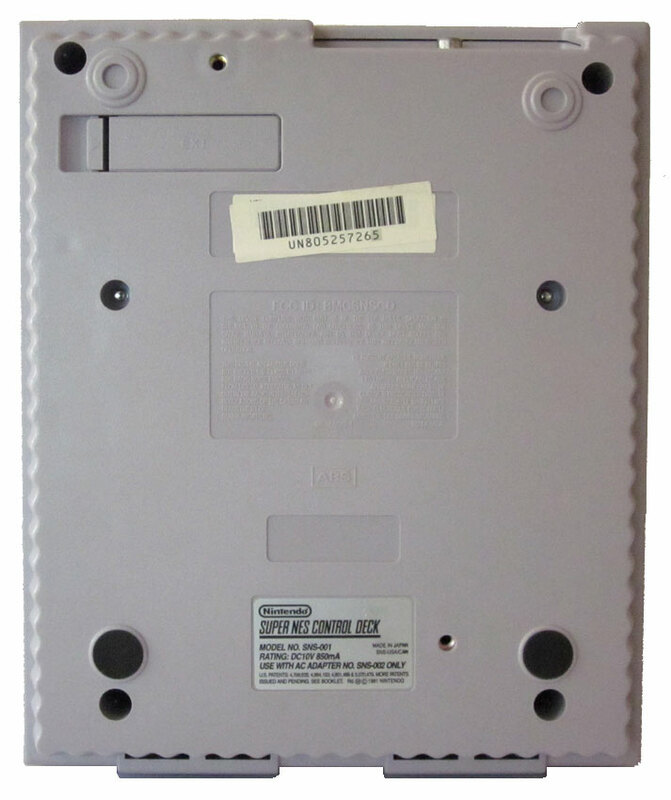 External Port on the bottom of the Nintendo SNES shown with the door/cover removed. 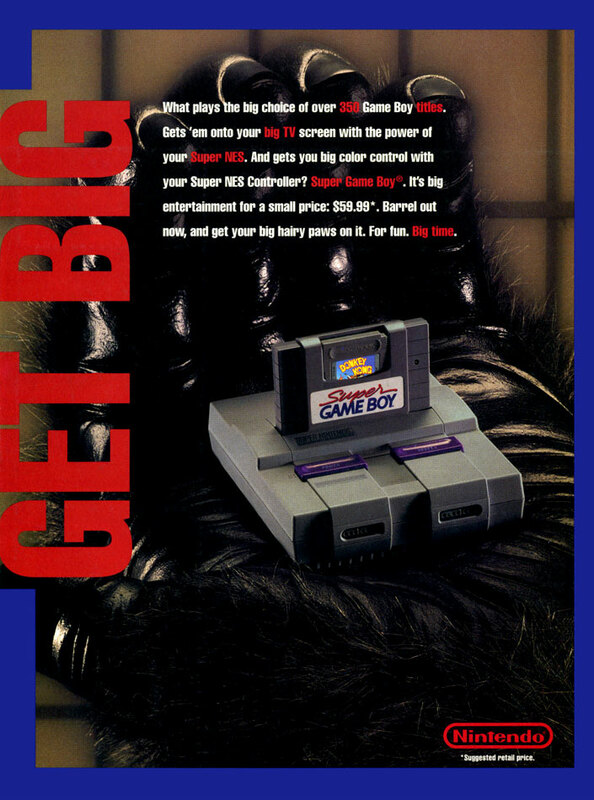 "Kong" ad for the Super Game Boy adapter that allowed Game Boy games to be played on the SNES - in color. Some games were designed to take advantage of the SGB while others used color mapping to jazz them up a bit for the TV. 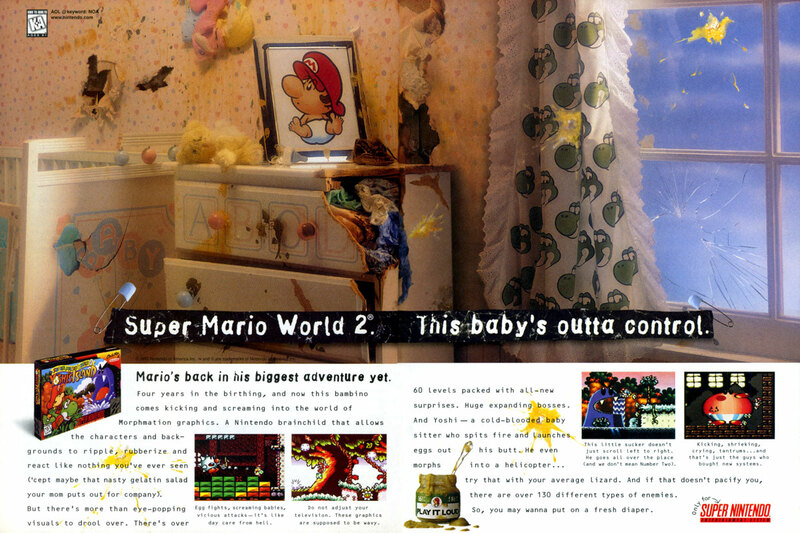 "Super Mario World ad for the SNES. "Super Mario World. This Baby's Outta Control"
Ad for the NakiTek Game Saver +. 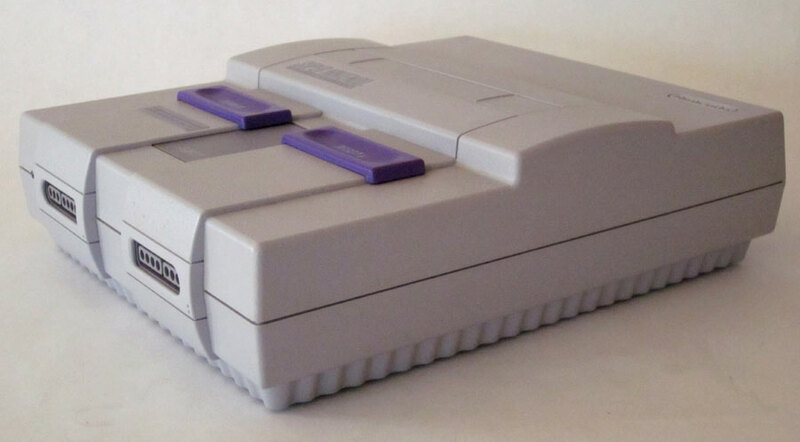 This device could be powered via the SNES console or by 4 AAA batteries and would allow you to save games on the SNES. 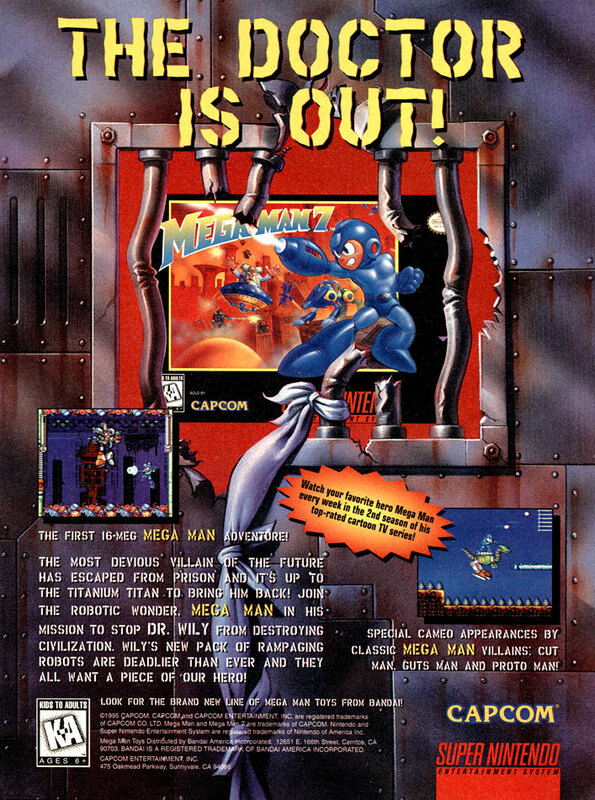 1995 ad for Capcom's Megaman 7 game. 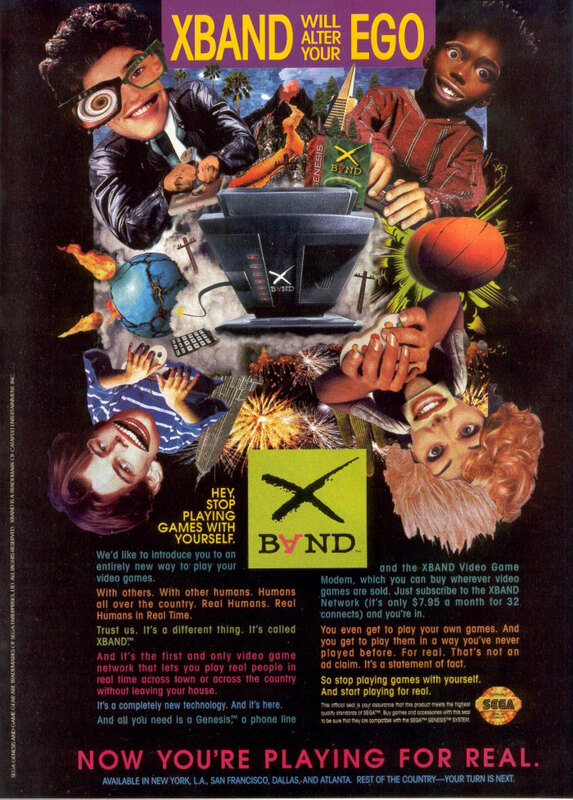 Catapult Entertainment's XBand modem ad.